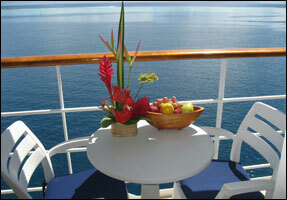 Book a cabin on the Paul Gauguin cruise ship with a balcony to share intimate moments. Enjoy romantic sunset cocktails at a candlelit table on La Palette's outdoor deck. The soft live combo music wafting from the indoor bar adds to the mood. You may wish to linger awhile at La Palette after the sunset. The table is candlelit and, because you are in the remote tropics, the stars shine brilliantly. Time your Paul Gauguin romantic cruise to coincide with a full moon (consult a moon-chart calendar on the internet). Dine at night at one of the outdoor tables on the deck that lines La Veranda restaurant. You will have the La Veranda menu and service, but with privacy. Enjoy the company of others and make new friends. Ask the restaurant maitre d' to sit you at a large table with other passengers. Convivial table conversation usually begins. Let the Travel Concierge Desk arrange a snorkeling or moonlight sailing outing for two. They can also arrange a private candlelit dinner on a tranquil beach. Attending this Polynesian ceremony is a good way to meet fellow honeymooners and anniversary celebrants. I briefly describe this event in my "Top 5 Experiences - Onboard" web page. You can say "I do" (or officially renew your vows) during the cruise. An affiliate of the cruise line will custom design memorable onboard and shore events for you and your wedding party.